Take eleven-year-old Timmy Failure — the clueless, comically self-confident CEO of the best detective agency in town, perhaps even the nation. Add his impressively lazy business partner, a very large polar bear named Total. Throw in the Failuremobile — Timmy’s mom’s Segway — and what you have is Total Failure, Inc., a global enterprise destined to make Timmy so rich his mother won’t have to stress out about the bills anymore. Of course, Timmy’s plan does not include the four-foot-tall female whose name shall not be uttered. And it doesn’t include Rollo Tookus, who is so obsessed with getting into "Stanfurd" that he can’t carry out a no-brainer spy mission. From the offbeat creator of Pearls Before Swine comes an endearingly bumbling hero in a caper whose peerless hilarity is accompanied by a whodunit twist. With perfectly paced visual humor, Stephan Pastis gets you snorting with laughter, then slyly carries the joke a beat further — or sweetens it with an unexpected poignant moment — making this a comics-inspired story (the first in a new series) that truly stands apart from the pack. 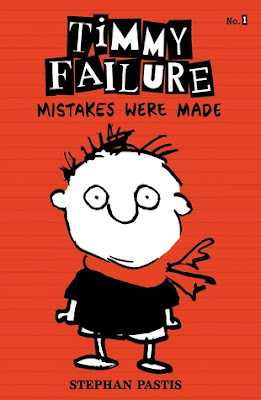 Stephan Pastis's Timmy Failure: Mistakes Were Made is not a failure! Timmy delights readers with his experience as one of the best detectives in the world. He lays it all out from his questionable sleuthing skills to silly mishaps at home and school. Timmy Failure is dead set on building his business into a detective agency empire, but he is not without trials: one being his lazy partner Total, who is also a polar bear, and others being his idiot best friend Rollo and his evil rival Corinna Corinna. How Timmy describes those around him is almost so exaggerated you might wonder what's wrong with him. Timmy has a very strong voice which actually surprised me since he's an eleven-year-old. He expresses his opinions very decidedly. I find that his peculiar personality adds to his story's humor and helps readers understand where his super self-confidence comes from. Then, of course, there are the illustrations that provide further detail for whatever crazy plan goes wrong. Those drawings are like an extension of Timmy's voice and just as comical. Pastis hits the mark when it comes to providing humorous entertainment for the middle grade age group. It's a big plus that adults and older teens will enjoy Timmy's antics as well. Timmy Failure: Mistakes Were Made is the just the first installment in Stephan Pastis's debut series and the hilarious plot will surely tide you over until the next!